We publish industry-specific information from experts in the field, and we allow readers free access to our content. However, producing great content is not without cost, so we are supported by quality companies who purchase advertising in our various publications designed to help you, the industry professional, do your job better. You get great content, and our advertisers get to put their brand messages in front of a high-quality audience with specific interests. We hope you will support those advertisers who support us in our efforts. 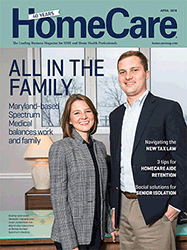 HomeCare is a publication of Cahaba Media Group.